New 2013 American Eagle gold and silver coins spark demand for bullion coins. Also, 99 numismatic products posted improving sales. Buying activity increased for a variety of United States Mint products — bullion and numismatic, new sales figures from the bureau show. 2013-dated American Eagles ignited demand for bullion gold and silver coins and 99 numismatic products notched higher week-over-week sales compared to the 21 noted in last week’s sales report. 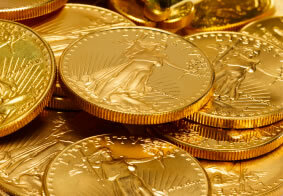 In American Eagle bullion products, the U.S. Mint began accepting orders for newly dated gold coins on Jan. 2 and then on Jan. 7 for 2013 silver coins. January sales of bullion Gold Eagles currently totals 73,000 ounces, topping nine different months in 2012. January sales of bullion Silver Eagles at 4,287,000 already ranks as the fourth highest month in the silver coin’s 27-year history. Place a mental asterisk beside most of the over-performing numismatic products, which includes nearly all gold and silver coins. Their weekly improvements seem more the result of sales normalizing after the Christmas holiday and not from rejuvenated collector interest. Next week’s U.S. Mint sales report will be more telling on that front. The upcoming sales report should also include or verify the final unaudited sales figures for the 2012 Proof Set, the 2012 Silver Proof Set and the 2012-W $10 Proof Gold Eagle that unexpectedly sold out as well as the 2011-dated coins and sets that went off-sale on Dec. 31. All these products show higher sales in this report. Next week’s report is likely to include the debut sales total for the newly released 2013 America the Beautiful Quarters Silver Proof Set. The following grid provides the latest weekly and January sales for all U.S. Mint bullion products. The weekly period covers sales from Jan. 3 to Jan. 9, 2013. The following tables provide the latest totals for US Mint numismatic clad, gold and silver coins as of Jan. 7, 2012. How can there be new (2013) sales of the 2011 Atb 5-ounce numismatics, when the Mint stopped selling them on December 31st?